maboshi’s arcade, aka maboshi: the three shape arcade for wiiware, is a game that i had a hard time getting into. the game has a unique hook: the board is divided into three sections, and you and two others can each take one, or you can save any of your replays to any of the three sections. the twist is that doing well in your section will give bonuses to the adjacent window or windows, making the game significantly easier for you and your partners. the game’s concept is definitely interesting, although i found the games themselves to be more frustrating than fun initially. you’re not required to play a different game in each of the three windows, and i liked the visual simplicity of the three games, each of which is based around simple shapes (circle, stick, and square). the reason the individual games were difficult for me to get into in spite of their simple controls (the first two require you to just use the A button while the third just uses the D-pad), is that the physics of the circle and stick games took a significant amount of time for me to internalize. the circle game features a fairly lightweight ball that spins clockwise or counterclockwise, and pressing the A button changes the direction of its spin. the changes in momentum and in turn the movement of the ball were hard to get used to and it was difficult to get it to go anywhere close to where i wanted it to, but after a fair amount of dogged persistence i was able to make much better progress. similarly, the stick game (which features a mechanic somewhat reminiscent of the mini-game chiritorie from the original warioware game on GBA, which was in turn based on an actual nintendo vacuum cleaner), was easier to get into than the circle game but still required some perserverance before i was able to make much progress. the square game is completely different from the other two and features a mechanic somewhat similar to the old snake games although in this case the game focuses on the tail of the snake which burns blocks. the square game is much slower paced and more of a puzzle game which gives it a unique feel compared to the other two, but also makes it feel a little out of place. (incidentally, an extension of that game has also been released as a standalone DSiware title called flametail). the game’s overall objective is to get a million points in each of the three sub-games (which also unlocks an expert mode), although getting 100,000 in each will unlock the credits, which was a good enough stopping point for me. a million points sounds daunting, but the game’s mechanics include a multiplier which maxes at 9x, so once you get it maxed out it should get much easier to rack up the points. 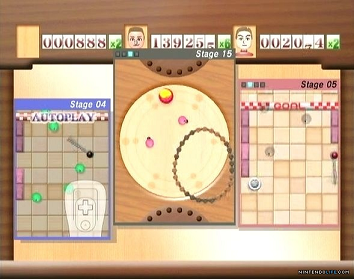 using your own high-scoring replays in adjacent windows to help you progress in your own game is key, and the game also has some bonuses in the form of sending your best replays over wi-fi to your buddies who can then use them in their own game, and also the ability to download a version of the game to your DS via DS download play (although, as with all download play, the game is lost if you power down your device). overall, although i enjoyed the inclusion of both arcade-y and puzzle elements and the unique hook, the game wasn’t a classic for me. i don’t think i have much patience for slogging through the same levels over and over again in order to try to get the goal of a million points in each sub-game, but the game provides a nice contrast to more typical multi-player types of games. an enjoyable game, but be prepared to be a bit patient and invest in some ramp-up time before it really starts to get you hooked in.